Every year the International Thespian Society holds theatre performance competitions for high school students throughout the country. Schools in every state prepare a 30-minute cutting of a play or musical to perform for a committee of judges that grade them on acting, staging, and other categories. The competition begins at the regional level, then finalists advance on to state and even the national stage in Nebraska. The Gibson Southern Theatre Department has been competing in the ITS competition for several years with much success, winning state in 2005 and 2008. And they’ve got high hopes for this year as well. The ITS chapter will be taking a 30-minute cutting of last spring’s Legally Blonde to the competition this year. Comprised of just under thirty students, the cast features many of the same students as last year as well as some new faces in the leading roles to replace graduated seniors. 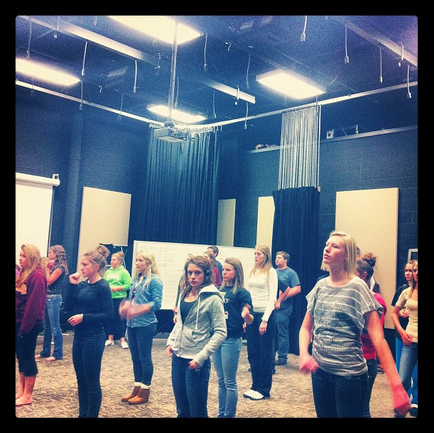 Rehearsals began over a month ago, and the cast and crew is excited to go up to Brown County this Saturday to compete.